I got back from Pennsylvania over the weekend and have been trying to get caught up here. Maybe I am getting old but I always feel like I need to sleep for 2 days after these trips! Apologies to anyone who came looking for Friday’s post, which didn’t make it up in the hurry. We’ll have some more from last week coming up. 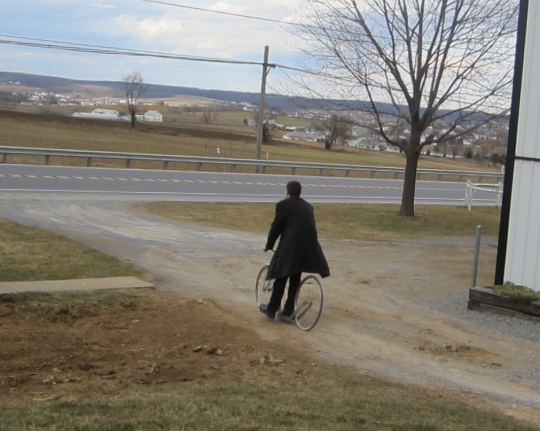 I also had a chance to preview the PBS American Experience Amish special which I’ll share a little bit on tomorrow. Great pictures as usual, Erik. Thanks for sharing! Always fun to see your pics, Erik, Thanks….those remind me of our trip up there, Oct. 2010. Such beautiful countryside, and such large farms….it takes a large family to maintain those!! Love the clothesline pics, too. Who shot the pictures of you on the scooter? Katie that was an Amish friend. My clothesline is unreachable through the snow. We are weeks yet from spring. Magdalena, how to some reach their clotheslines, if they are high up, beyond reach? Do they use a pulley system, through a upper story window?? Only guessing…That was one of the things I found most interesting when we were in Lancaster. And why so “high up”? Are the breezes better, with faster drying time? Thanks!! Making me really miss God’s Country … beautiful pictures. We’re hoping for a trip late summer/early fall. Checking out some more areas for retirement up there. Now do you have an order in for your scooter? Maybe I need to get that in! I haven’t seen this bike wheel model so much, I should have asked what the story is. 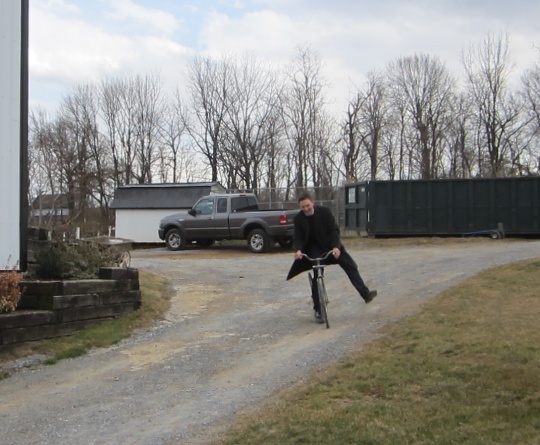 Erik, Thanks for the Amish photos. Some of them end up as wallpaper on my computer. Really nice to hear Randy, glad you and others here enjoy them. As to wallpaper if there is a particular photo you would like a larger version of I might be able to provide it, just send me an email. Love your pictures!!! Thanks for sharing!!! 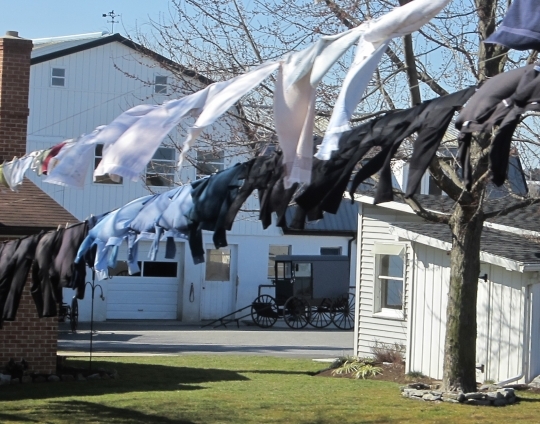 I noticed the same type of clothesline system in Charm, Ohio. It looked like the line was coming from an upper window area. I also wondered what the benefit was–maybe ease in loading during colder months? I also wondered if they dried faster. They catch the wind and dry faster. And it also saves miles of steps if you don’t have to walk along the lines. Great pics! Did you make it to the Strasburg Mud Sale? What wonderful and fun pictures from Lancaster, Erik! It looks like you had a ball on the scooter. Did you get a chance to make it to any of the sales/auctions going around this weekend? Strasburg had a big one and it was the most crowded I had seen in years! Great bargains to be had though! I know there were a couple more in Rawlinsville and Willow Valley. 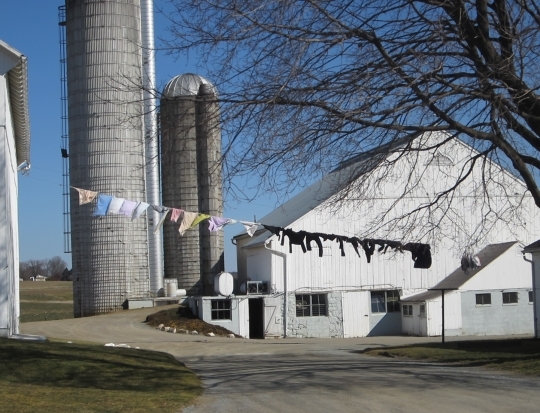 I love the way you truly captured the essence of driving through the country — I go along RT 222 and see farm houses with the clotheslines out and it just so picturesque. I just love the pictures with the clothesline. Reminds me of when I was a kid and had to hang the clothes up on the line and take them down when I came home from school. I wish I could still hang my clothes up like that. There is nothing like the smell of fresh air in clothes. did you make it to the mud sales???????? Hi Sherry see above. Didn’t get to the sales but I got in some mud, Fri AM was pretty sloppy and I tromped through a bunch outside my friend’s home. And of course I was wearing dress shoes so that didn’t help anybody 🙂 But yes I think the Lancaster County mud is going to cooperate for some of these sales. Mud sales are consignment auctions held annually in fields that are muddy from spring thawing. They usually benefit fire companies, Amish schools or hospital bills. A big variety of items. Really worth your time to go if you’re in the area of one. Here’s a link that gives some dates. Thanks Erik! Once again when I feel the stress of this “English” world, you come up with some beautiful pics of the Amish to bring relief to my hectic world! God bless you!! Erik, thanks for sharing all your photos. Loved the schoolhouse & clothesline photos best. 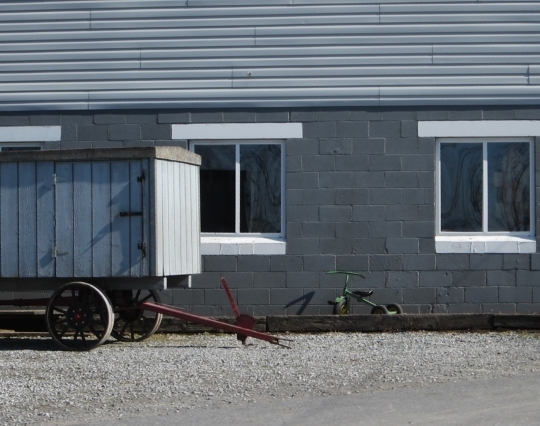 Re: Clothesline picture – In the background, to the left of the buggy & the door, there looks to be a four pane window but it appears more like a garage door panel than an actual wall & window. Please explain to me what I’m seeing, if possible. Thanks Carolyn, in the photo it just looks just like a common pull-up garage/shed door, maybe there’s another name for them. 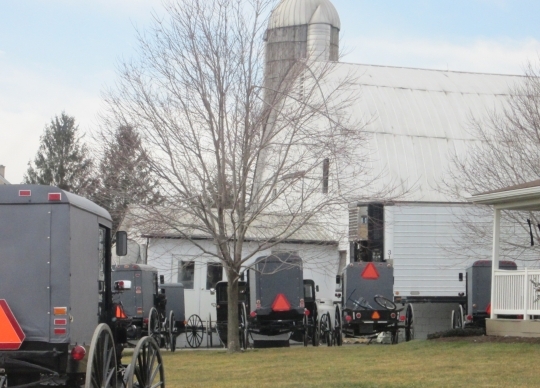 Amish have these on their buildings. Erik, I loved the photos! I can see signs of spring in them, with greening grass and other plants popping up. 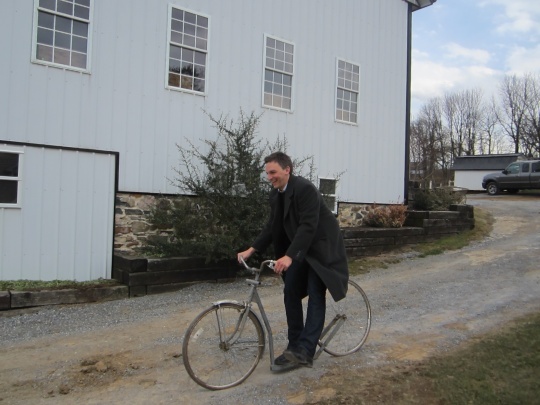 I’m curious about the third photo, the one with all of the Amish farmhouses and buildings. Wow! It almost looks like a small town! Is it one family (extended?) or more? Those buildings in the background—are they outbuildings, or are there also homes among them? 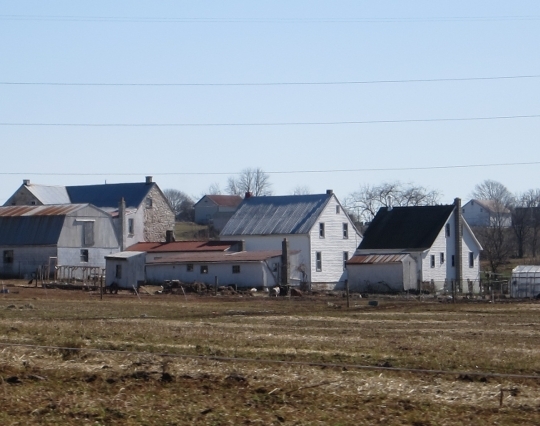 I don’t think I’ve ever seen so many Amish buildings (farm or residential) in one small general area like that. What settlement is it, and what’s the population? (I’ve never been to Lancaster, though I know it varies being the largest or 2nd largest Amish settlement in the U.S.). Keep those photos coming! Love ’em!!! Alice Mary that is probably one extended family, it is in central Lancaster County. 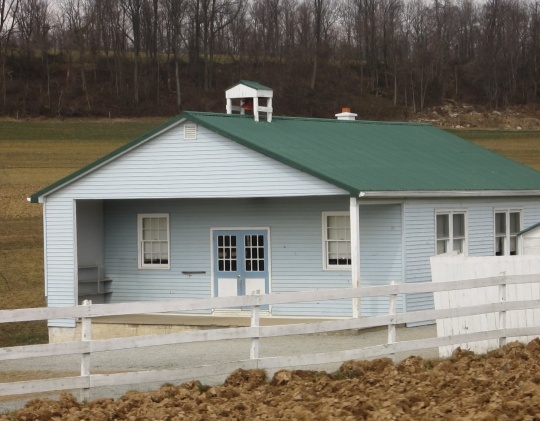 You’re seeing some barns and other buildings and looks like 3 homes. 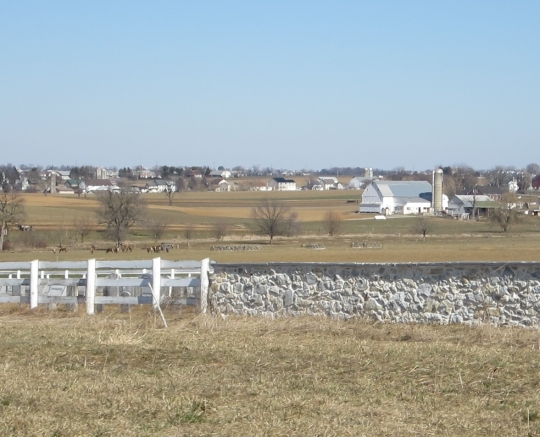 In the background are other farms but looks like what is visible are only barns/outbuildings. I was a bit dressed up in the photos because I was going to the Kutztown U. talk later that day…not my normal scooter uniform! Always love your pix, Eric, keep up the good work! You already got to watch the documentary???!!!! (My lips are sealed, lest I let out a whiny sounding “no fair!”) Anybody know if it will be available to watch online after it airs on TV? I did Naomi, I am watching it again with family tonight. I just posted a few comments on it today. Thanks, Wm Justice. I wasn’t sure if they post every show online afterwards, but after following your link and looking more closely, it seems they do have all recent shows available. My family and I passed through Lancaster on the 18th and my children were confused and then fascinated by the scooters. My husband kept saying, “But isn’t it a bike? ?” We had a lovely time driving the back roads and stopping at some favorite shops. Nothing like rolling farmland and vast sky to relax and calm the soul. Yes, that looks a bit like an old style bicycle, but just because it has big wheels doesn’t mean it can’t be a scooter, for one thing I can’t see a seat, or peddles. I really want to watch the American Experience episode on the Amish, I don’t mind missing Peter Mansbridge and Clare Martin’s witty repartee at the end of “The National”; including this evening her once being nipped by a horse on her backside. She’s English, really, English, not Amish Englisher English, but pip pip tally ho, bob’s your uncle and rob’s randy right, English. Right, I hope to see it. I like the American Experience series, what a good week for me though, on Sunday the CBC re-aired “John A…” (and I watched it, Patrick McKenna [The Red Green Show] wasn’t as prominent as I was lead to believe, but he was good) and now this I hope. Naomi, the American experience is on tonight. You could have set it to record, if you can’t be there to watch it. I pre-set the recorder in case something came up. Looked like you had gone back to your boyhood days Erik, as you rode the scooter! Comparing that with your big truck in the background funny at at Amish home. Hope you didn’t get your coat tails caught in the wheels. 😀 I had a scooter when I was a kid but the wheels were much smaller than those. Those look to be bicycle size? Jessica I did not thankfully. I didn’t try any tricky stuff though and was just focused on getting down the hill 🙂 They are bike size/style tires. Maybe scooter aficionados on this thread are more familiar with this model, which is different from the typical Amish scooter you see nowadays. 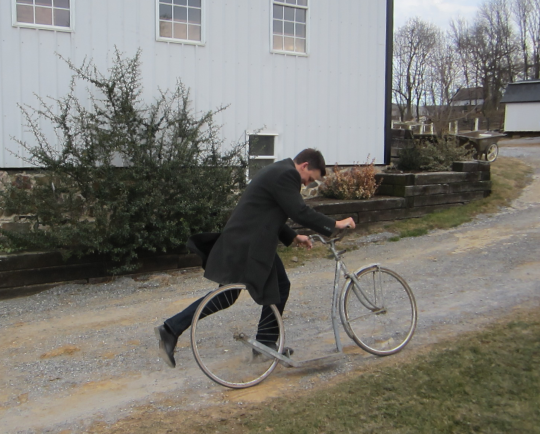 I’m not sure how many in Lancaster do the bike style tires, or maybe I haven’t been paying close enough attention. I’m not sure if there is a “community standard” Amish scooter or not. The big bike-wheeled scooters are for adults who are less likely to try to bump up over obstacles like railroad ties and sidewalk edges. Spoke wheels bend easily, and kids wreck them pretty quickly. The more solid wheels on kids’ scooters can accept a lot of bumps before bending the wheel out of round.